A luscious blend of sweet almonds, nutty mesquite and intense dates. A delicious treat for all healthy food lovers! Your blender is asking for sweet almonds, nutty fine mesquite powder, dates and water. Blend all these high-quality ingredients into a delicious, creamy drink. 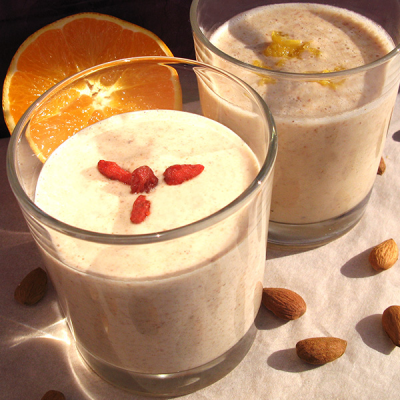 Lifefood Almond Mesquite Drink is always a pleasure whether you enjoy it for breakfast, as a snack or in the evening. Enjoy every moment. Set the drink aside for a thicker consistency. It will then be perfect to add to cereals or as sweet dessert. How about combining it with your favourite fresh fruit? Or simply enjoy it with some carob sauce. Made with love. The given amount serves four.